Did you think you'd be able to sort of piece together what "hello" looked like in Ukrainian because the English word was right next to it? Yeah, I figured I'd be able to figure out what words meant in Ukraine too, but that was before I got there. This should give you an idea of just how clueless I was while I was there having twin boys. Welcome to my Flip Flops in Kyiv blog. Here I'm going to write some shorter stories about different crazy/weird/funny/scary things that happened during our time over there. Some of them you'll find in the book, in more detail of course, and others you won't. I feel like I owe it to anyone who's thinking about this to make sure they have an inkling as to what they're in for if they do this. I'll be updating this section of the Web site frequently, so check back. You never know what type of story you might find here. I certainly never knew what each day would entail over there. 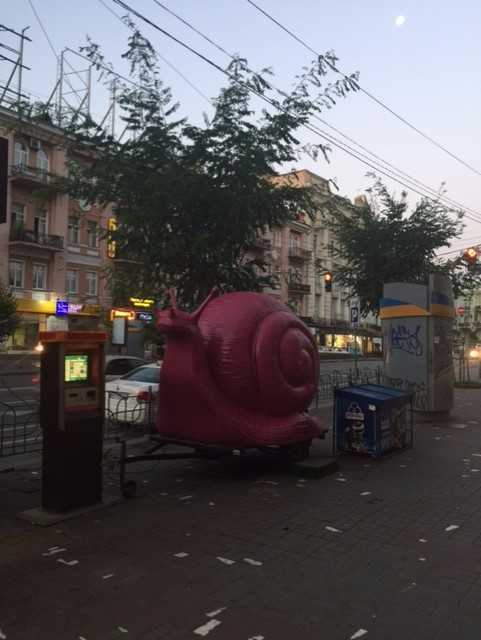 Just your average giant snail thing on wheels that you see in Kyiv at dawn.